Today we visited a patch of countryside less than 30 minutes away from our bustling city: the Country Pumpkin Patch, in Richmond. We had a wonderful time with some friends of ours despite the fact that there is some room for improvement. First, their Website doesn’t work… Except when it does. Which seems to be random. And I was slightly disappointed by the farm animals that they have: 2 lamas, 2 miniature goats and 2 pigs. I thought there was a petting zoo, but I guess I must have read their site wrong. The price tag is a bit high ($10 per person, free for 2 and under, although some of the signs on the site say 3 and under, some 2 and under). But the price does include a pumpkin of your choice and a hay-ride. Our boy and the son of our friends had a good time dancing to the music and sitting on pumpkins. They will enjoy it more when they’re older, and we’re definitely going to go back. I love to seize any opportunity to show my son where his food comes from. This is a great place to go to enjoy a sunny fall day. -Mommy, look at me, I swear I’ll manage to lift it! 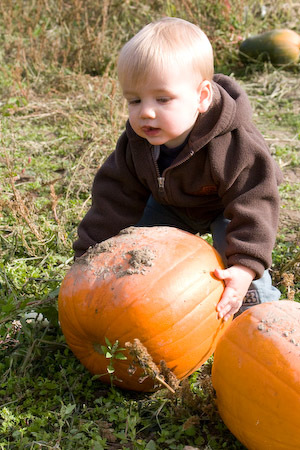 This entry was posted on Monday, October 13th, 2008 at 8:22 pm	and is filed under Family life, Outdoors, Resources. You can follow any responses to this entry through the RSS 2.0 feed. Both comments and pings are currently closed. fiestaware plates on I’m sorry, why is there lead in my dinnerware?